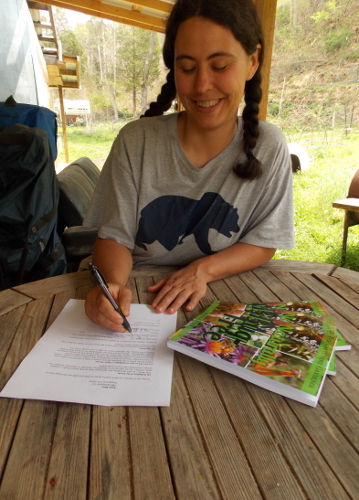 Although the announcement makes me feel a bit flaky, I'm excited to tell you that I've signed a contract with Skyhorse to make Naturally Bug-Free available in print in spring 2015! The book will probably be slightly renamed (to The Naturally Bug-Free Garden) and will be a moderately expanded version of the ebook currently up on Amazon. Why the change of tune? Close readers will recall that I had offered the book to Skyhorse, but thought the deal was off when they balked at leaving me the ebook rights. I'd like to say that I'm a keen negotiator, but I think that Skyhorse is instead a smart publisher willing to change with the times. Whatever the reason, the publishing house decided to take a chance on me --- the first time they've ever bought a title without the ebook rights attached --- and they came back to me last Friday with a new offer. I was more than happy to accept a slightly lower advance in exchange for keeping the e-rights for myself while having the paper edition put together and distributed by pros. Skyhorse sold many more copies of The Weekend Homesteader on paper than I thought they would, and they definitely moved far more than I ever could have shifted on my own, so I'll be thrilled to have them work their print magic on my bug book. What's relevant to you, the reader? Three things. First, if you've already bought the ebook or plan to buy it in the near future, you'll have the old version, but I'll update the ebook with the Skyhorse version in a month or two. At that time, Amazon will let you upgrade to the revised version for free. As always, when you buy one of my ebooks, you get free upgrades forever! Second, I plan to unpublish the homemade paper version tomorrow (although I'll still have a few on hand for giveaways), so if you really, really want my original version rather than waiting a year to get the official version on paper, you'd better grab it now. This is especially relevant for those of you who want the cheap black and white version since the official version will be full color and more expensive, although probably cheaper than the full-color version I offered. Finally, I'm taking this opportunity to expand the book a bit, so some of you may see your garden featured in print! 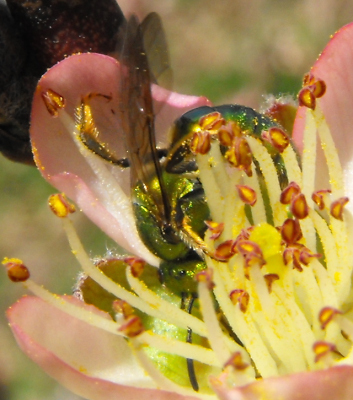 Drop an email to anna@kitenet.net with high-resolution photos (anything except pictures from a camera phone will probably work) and an explanation of your experience with controlling pest insects in the garden without chemicals and you might be featured in the print edition. To sweeten the pot, anyone whose contributions make the cut will win one of our homesteading care packages --- a paperback of your choice (The Weekend Homesteader, Watermelon Summer, or my color version of Naturally Bug-Free), a kefir starter culture, some of our favorite seeds, and a Walden Effect t-shirt (size L or 2XL). That's very exciting. Your example is an encouragement to all aspiring homestead writers. Into the big time :). Nice Job! I am looking forward to hearing when your publishing income exceeds your farm income. Seems like your writing career is taking off nicely. Be careful not to overcommit yourself, though. John --- Not sure what you call our farm income since we don't actually sell any traditional farm products? Our main income source is our chicken waterers, which definitely bring in more than my writing, but that income is also more seasonal. The books have gotten to the point where if we needed to subsist on my writing income, we could, but there'd be a lot of belt-tightening (no new livestock or fruit tree experiments, etc.). Roland --- Always excellent advice. I'm a big over-commiter, and it is a bit scary to think I have a book due in a month. But the book is basically written; I just have to move files around and format it the way my publisher wants it, so hopefully I won't be going nuts at the end of May.... I usually depend on Mark to tell me when I'm adding too much to the list, and he seemed in favor of the writing project, so hopefully it'll be okay. Wow! I'm so excited about this! I have my own paper copy of The Weekend Homesteader. I must say, I really prefer having paper copies of books. Sure, a digital copy is a great backup, but nothing beats holding a book in your hands. I will have to get my own copy of your new book even though I have your ebook version. This is all very inspiring! Perhaps I'll be able to publish a book one day as well. I wish you the best of luck! I look forward to having a collection of your books in the future.